Including horse safaris in your itinerary in Mozambique is probably the best thing you can do all year. 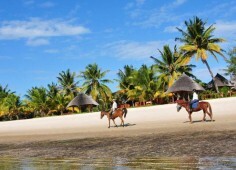 Although not much can be said about horse riding in the Mozambican wildlife reserves, mostly due to low game concentrations and lack thereof, it can be said that the coastal area of Vilanculos and the wondrous islands in the Bazaruto Archipelago provides the most enchanting beach rides. Imagine yourself saddled on a horse, galloping into the sunset with the salty sea breezes rustling through your hair? Live the dream by booking a holiday to Vilanculos or the Bazaruto Archipelago, the only places in Mozambique, where you can experience exceptional horse riding and daytime trail rides. These horse safaris are suitable for all levels of riding, from beginner to expert riders. Children are also catered for, making your family holidays in Mozambique extra special. When you include horse riding to your list of activities, you will find yourself exploring the breathtaking coastline on horseback and swimming with your horse in the turquoise sea. You can tailor your own unique horse safaris according to your specific requirements, incorporating everything else you wish to experience during your unforgettable holiday in Mozambique. The Bazaruto waters are crystal clear and harbor an astounding array of aquatic species for you to feast your eyes on while snorkeling and scuba diving. This region is home to East Africa’s largest concentration of the endangered dugong and is also renowned as the best marlin fishing destination in the region. This is all the encouragement you need to plan your next holiday to this wonderland. So, what are you waiting for! Take the plunge and arrange your horse safaris with the specialists in Mozambique travel. Our friendly consultants regularly travel to the Bazaruto and all the other exciting destinations in the country to impart their firsthand experience and knowledge to our clients. We know where to go, when to go and how best to get there! Get in touch with us now!